With investor demand for leveraged loans remaining strong (see discussion), one structural component has not changed. The majority of new leveraged loans still have a LIBOR floor. That means these loans will pay a minimum coupon plus spread, no matter what LIBOR does. In fact according to LCD, the average floor of 1.25% in October has changed little this year for new-issue loans in spite of investor demand for the product. That is investors want these loans but they will typically only buy loans that have the LIBOR floor included. A loan with a spread of 3% and a floor of 1.25% will pay 4.25% (act/360) annually, even though the 3m LIBOR is only 0.32%. 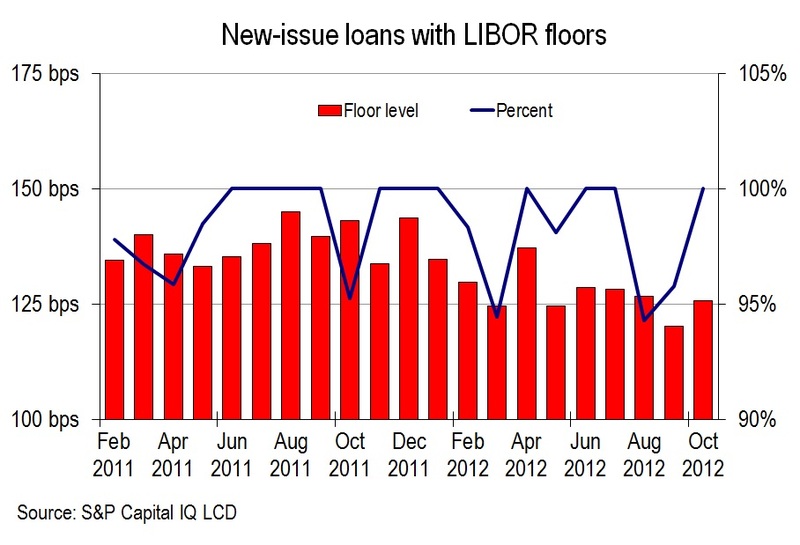 The chart below shows the percentage of new issue loans with a LIBOR floor and the average floor level for each month. Those who think in terms of options will recognize that the borrower (in addition to paying the usual LIBOR + spread) has written the investor/lender a series of in-the-money put options on LIBOR (an in-the-money LIBOR floor). 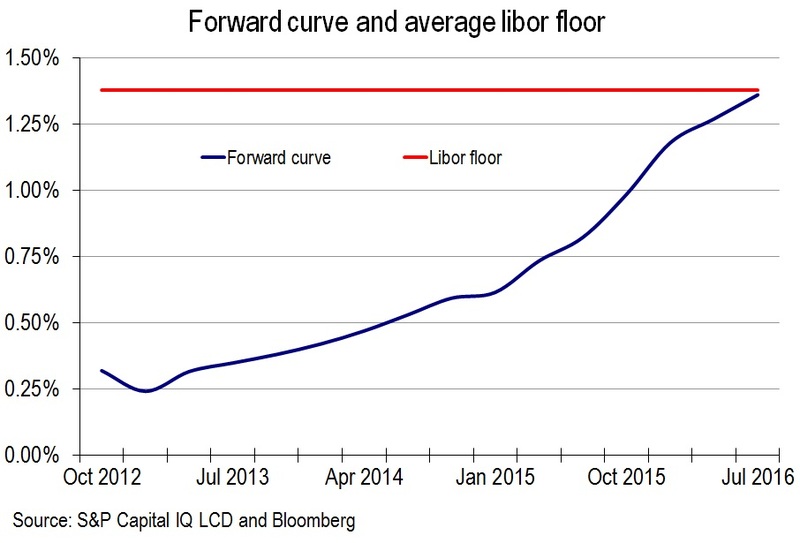 Even the options with longer maturities are in-the-money because the forward LIBOR curve is below the average floor level all the way out to 2016 (option strike level is above the forward underlying). And most of these loans do not go too far beyond that point. Even if the maturity is out to five years, most loans will amortize/prepay to a shorter average maturity (at least based on history). 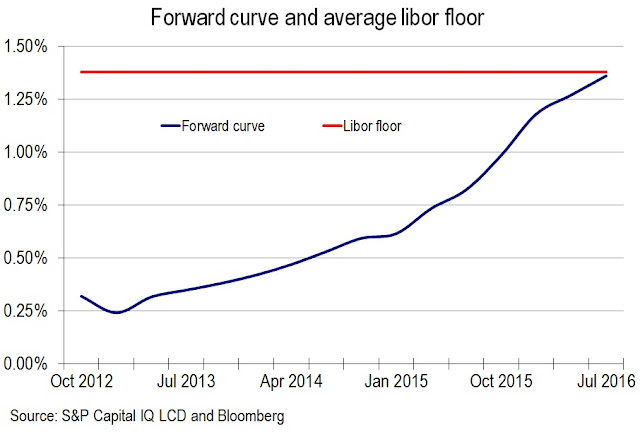 The rationale for maintaining a LIBOR floor on new deals is simple. Given the Fed's efforts to maintain near zero rates for a prolonged period of time, the probability of LIBOR rising substantially is low. In order for this product to compete with high yield bonds, which are fixed rate instruments, it needs to guarantee some minimum coupon in spite of what the Fed is doing. To be sure, investors holding these loans will receive a smaller coupon on average than with high yield bonds, but the floor makes that difference less of an issue. What attracts some investors to leveraged loans is that they receive a minimum coupon because of the floor but to some extent they also get an inflation hedge. Should inflation surprise to the upside, LIBOR may in fact rise above the floor level, increasing the coupon. HY bonds on the other hand will continue paying a fixed coupon.